Every now and then, we like a fluffy muffin crammed with chocolate chips. But, like, just one. 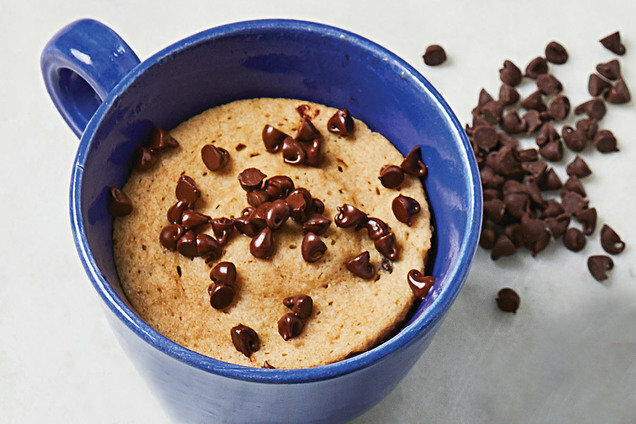 So rather than choose between making a whole batch of muffins or buying a calorie-packed sugar bomb, we make this single-serve muffin in the microwave! Spray a microwave-safe mug with nonstick spray. Add butter, and microwave for 10 seconds, or until melted. Add applesauce, egg, almond milk, and vanilla extract. Stir until uniform. Add all remaining ingredients except chocolate chips. Whisk with a fork until just combined. Gently fold in 1 tsp. chocolate chips. Microwave for 2 minutes, or until set. Top with remaining 1 tsp. chocolate chips. New Episode Alert: Cauliflower Is the New Black! ⭑ Ask HG: How exactly DO you rice cauliflower? ⭑ Chew & Tell: featuring CAULIFLOWER FRIED RICE in a bag! ⭑ Lisa Loves It: a cauliflower-based BREAD swap! LISTEN NOW (OR SUBSCRIBE AND LISTEN LATER)! Happy National Piña Colada Day, July 10th! Our version of the classic blended cocktail has way less sugar than your average colada, plus a bonus boost of protein! Help a pal out! Click "Send to a Friend" to send them this brand-new recipe.